So, I figured out why those "weeds" in my yard won't die: it's bermuda grass, DOH! I've been pulling it out like crazy and it just kept spreading and spreading. I had none in the spring and now 1/2 of my backyard has been taken over. Does anyone know of a specific herbicide that I can use to kill the bermuda but not my fescue? Ugh, we've got the same problem. Do a google search and you'll find some products that are supposed to kill Bermuda in Fescue lawns. I think I found three online but I could only find 1 of them at the local stores. I bought something at Lowe's made by Bayer Advanced. I forget the name, but I had to go to 2 Lowe's because the first one was sold out of it. I've sprayed it once so far and I noticed that some of the Bermuda died, but I guess that fall is not the greatest time to use it because it's not growing like crazy right now. Of all the info I found online, probably the most common refrain was that you have to be as aggressive as the Bermuda is. Just spraying it once won't do it--you have to reapply every month or so and it is better to do it in the spring & summer as new growth is happening. It soaks up the chemical through the new growth. Bermuda has deep roots and spreads like crazy. If you don't get all of the roots pulled (which would be nearly impossible), it will just regrow from the bits that are left. I read this response on a landscaping forum I frequent with regard to a similar question about getting rid of bermuda. "Your only option is to move. If there is bermuda nearby, it will always find its way into your lawn. You can fight it each month for the rest of your life, but the bermuda will outlive you and grow right over your grave." You really can't win. I have tried everything, short of solar killing the grass/seeds. Even after pummeling it, and having an incredibly lush fescue carpet on top of it, it still came back in areas, and rapidly grows from there. I even resorted to Roundup. That only knocks it back as well. It won't completely kill it. So I have given up. I will be reseeding next spring with improved seeded bermuda in the hopes that it will over power the common bermuda in my lawn. If half of your back yard is indeed bermuda you really have no choice but to accept it, and realize that it is the best fit for your yard. 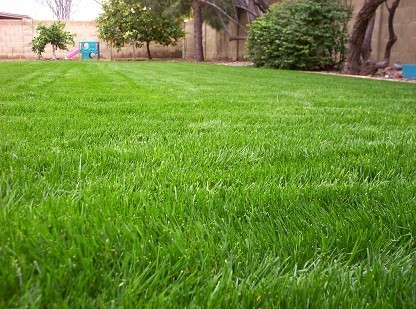 If you want a green lawn all year, buy rye seed and overseed in the fall with rye. Rye actually looks really good, much like fescue. It will look nice in the fall/spring and dye out with the heat, when the bermuda comes to life. Protect your flower beds and just let it happen. Bermuda will be in your yard from now on no matter what. You *could* go to centipede, that will actually overpower bermuda, as well as zoysia. But those two can't be overseeded in the fall. Here is a picture of rye overseed on top of bermuda. Same problem here....I'm going to try to cover it with astroturf. You can't get rid of it. I've had luck getting rid of St Augustine with MSMA, but that was in a Bermuda lawn and the MSMA didn't even damage the Bermuda. I am having the same problem, only the spot where our comes from is a small 3 foot section of grass. I am debating digging a trench at the property line and filling it with gravel/rock garden. Do ya'll think that would work? The problem is that the bylaws of my HOA prohibit bermuda, zoysia, and centipede grasses explicitly, and also prohibits any other type of grass that "overtakes" the neighbor's yard (can't remember the exact wording). I need to find a way to get rid of it. I tried pouring boiling water on it and it definitely killed it (turning it brown in two days) but I don't know if it will come back (I also only did about 1/4 of all bermuda as an organic experiment (not having to resort to chemicals).